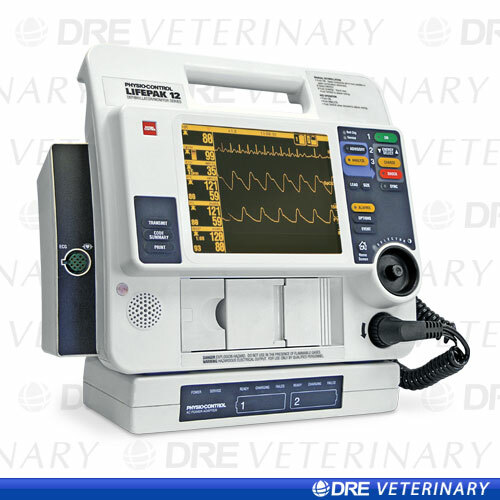 The Medtronic Physio-Control Lifepak 12 is professionally refurbished from DRE Veterinary. Aftermarket availability is limited on this item. Contact your DRE representative for available models and feature sets. Compact and portable. The unit weighs 14.5 pounds. Works with QUIK-COMBO™ pacing/ defibrillation/ECG electrodes. Convenient upgrades. Component based system designed with long term use in mind. Optional AED, manual defibrillation or both, depending on users’ skills and comfort level. Add noninvasive pacing, pulse oximetry (SpO2), 12-lead ECG, EL or LCD display, capnography and noninvasive blood pressure (NIBP). 50mm or 100mm printers, accessories and power choices. Masimo SET pulse oximetery offers accurate and stable oxygen saturation monitoring.